I recently spent a week painting in New York City with my good friend Andrew Lattimore. 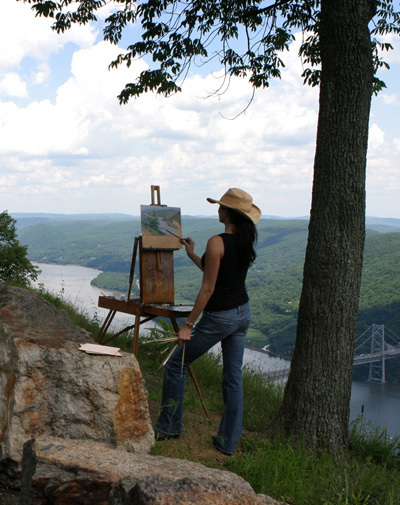 My goal was to start a couple of large paintings on location. We spent an entire day scouting new locations in Brooklyn in the rain. Frustrated by losing a painting day, I spent that night cutting up black garbage bags to cover my easel and gear and setting up my palette, determined to start the next day. 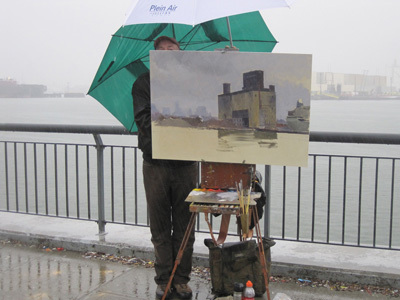 The following morning was cold and rainy, but by 10:30 I was painting in Red Hook Brooklyn. Even with a large umbrella I had to repeatedly wipe the palette and my 28x40" canvas. Unable to step away from the canvas for fear of it blowing over I stopped only long enough to take a sip of coffee or a bite of bagel. The canvas was tilted toward me and I was bent over the palette in an effort to minimize the water. The wind picked up and the cold began to seep through my ever-damping gear. The rain was now blowing in under the umbrella. After almost three hours, I had only covered 2/3 of the canvas covered. Despite my best bailing efforts my paint box began to fill up with rain. The umbrella, heavy with water, unleashed its contents down my neck and back. I cursed loudly and repeatedly and - of course - it rained harder. My indignence and frustration rose in equal parts and filled me with an insane drive to cover the canvas. 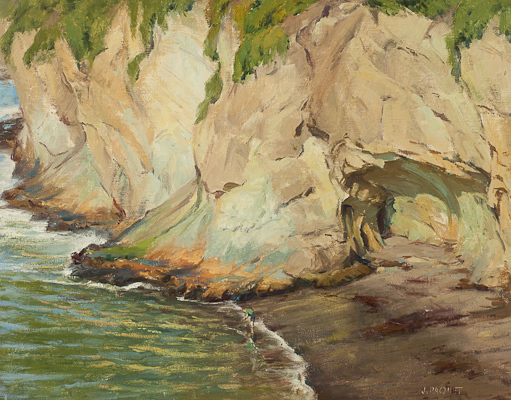 Seeing my plight, Andrew walked over with a second large umbrella and with one hand on it, and one on the canvas to steady it, I was able to paint. For the last hour I remember little but shocks of ice water running off the umbrellas, down our backs, filling our shoes. Full-automatic bursts of profanity issued from my lips. We laughed like little kids at the absurdity of it all. Like any crime of passion; it was a blur. An out-of-body experience. The canvas was finally covered and I was splattered with rain and lead white. We got in the car for a two hour ride home in traffic. I was wet and shivering yet filled with profound sense of bliss. As they say, "You had to be there." Thanks to Andy - and to Mother Nature: All is forgiven. I just want to say thank you to the CAC for hiring me as their keynote speaker for the symposium. What an honor to speak and demo for a wonderful group of artists. 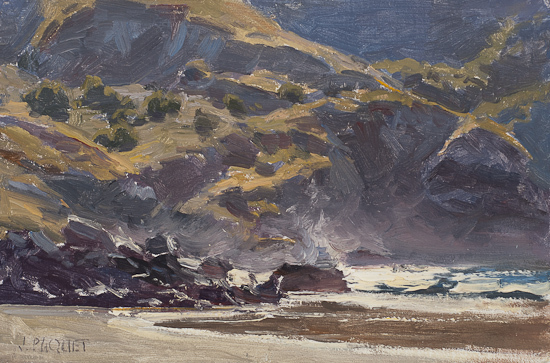 For those who attended my 5th annual Workshop on Catalina Island, you were a great group - thanks to you as well!